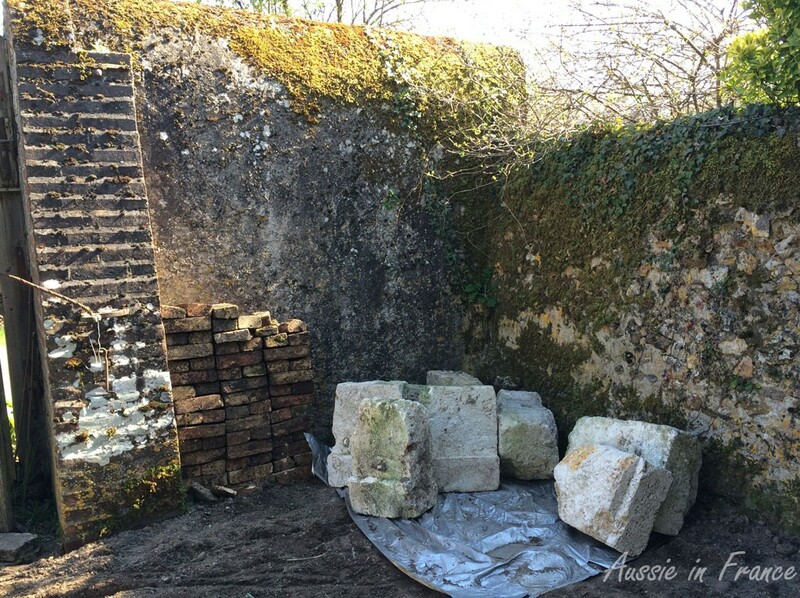 Now that the practice window is coming along nicely and we’ve bought the secondhand stone sills and bricks for the kitchen windows, the next step is to buy some freestone blocks for the window on the back façade so it will match the ones in front. For those who don’t know what freestone is (like me! ), it’s a fine grain stone which can be cut easily in any direction, in particular a type of sandstone or limestone. In our area, they are made of limestone. As usual, Jean Michel starts searching through leboncoin.com. “This looks good”, he says, one evening in front of the fire, “only 50 euro for a whole heap of stones, some of them very big – about 80 kilos”, he adds. I nearly have a fit. “What are we going to do with them all and how are we going to transport them?”” We’ll do a couple of trips with the trailer”, he replies. “Won’t they be too big to use?” “Je me débrouillerai“, he reassures me. He phones and talks to a young woman who hardly seems the type to be selling 80 kilo stones. It takes us an hour to get there and we are about ten minutes early for our 7 pm appointment. It doesn’t look like a house owned by someone selling freestones either. Two young people in their early thirties soon pull up in a car. The young man gets out and opens the gate. The young woman drives in. She gets out and shakes our hands. “I’ll go and let the hens out”, says Olivier. Christelle shows us the stones and Jean Michel drives the trailer in next to them. He then proceeds to put two planks at the back of the trailer to form a slide for the trolley he’s going to use. Olivier soon returns, having changed into yard clothes. He is tall and slim and I wonder if he is really going to be much help. However, he turns out to be amazingly strong, which is a good thing because I seriously do not think I would have been much use! This is a much heavier operation than the bricks. It takes them both more than an hour to get 15 stones of various shapes and sizes into the trailer. 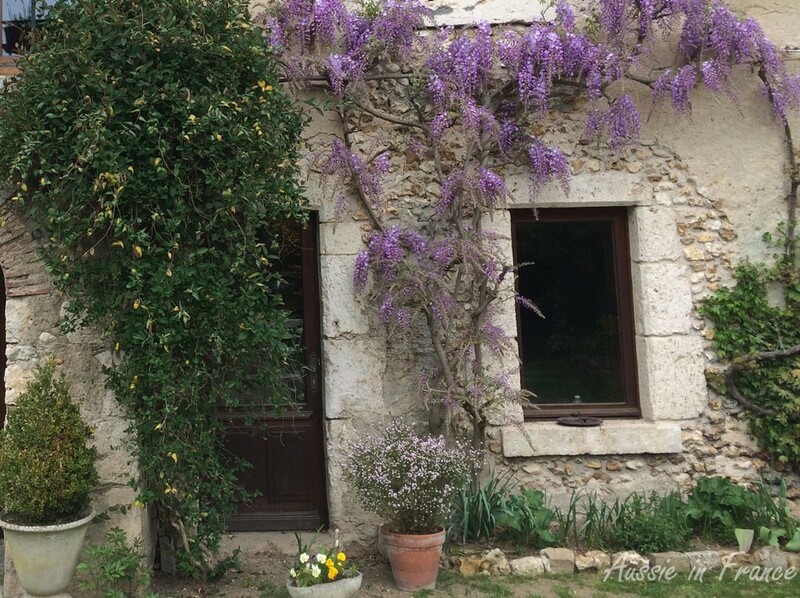 In the meantime, I chat with Christelle about her house and garden. The land, which originally housed a large barn, belonged to her grandmother. 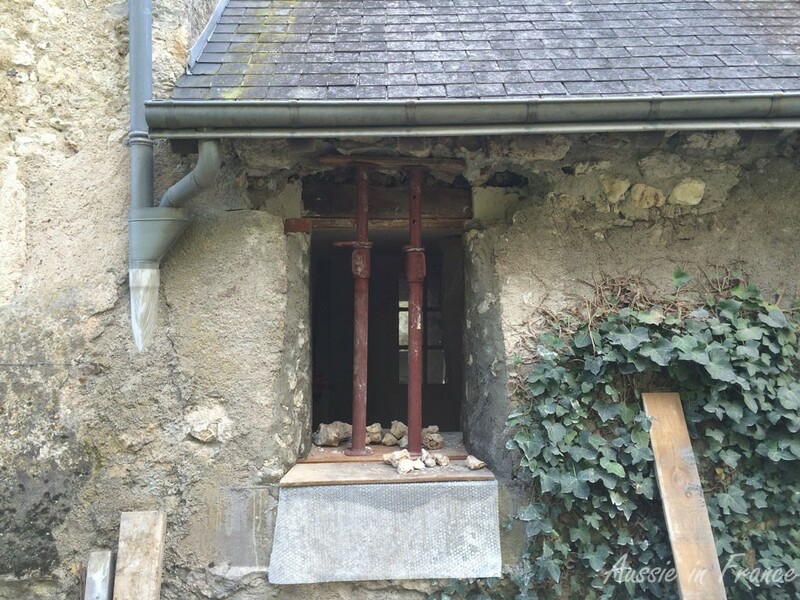 After she and Olivier bought it, the barn was demolished (hence the stones) and they had a new house built because the barn would have cost far too much to renovate. Christelle’s parents live opposite. Her father used to be a farmer and still has a few hectares. 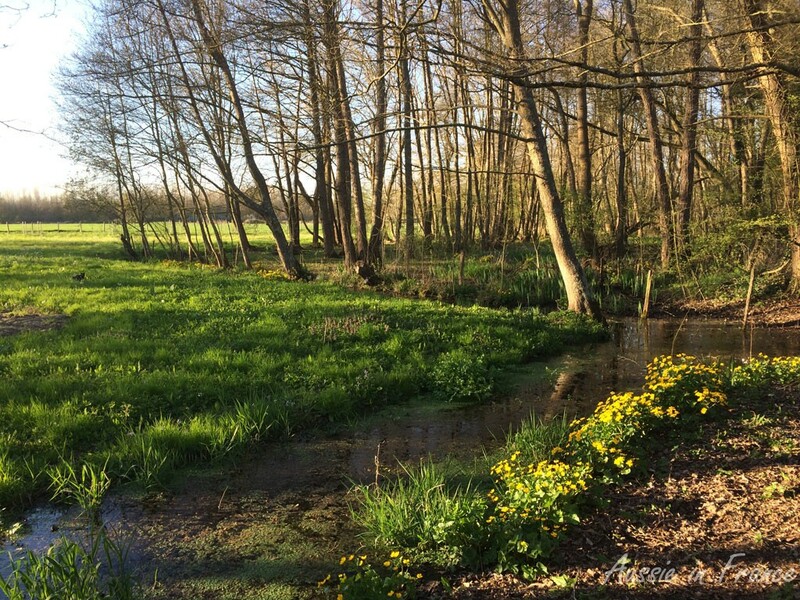 Christelle and Oliver’s garden is very large with a lot of trees and even a little stream at the bottom. Next door, there is a pond. It looks very idyllic in the spring and they have large French windows at the back of the house to make the most of the view. The trailer is now packed and ready to go. Christelle asks if we’d like to stay for a drink but we explain it is an intermittent fast day so all we can have is water. They ask where I come from and are thrilled to learn I’m Australian. They visited Christelle’s sister’s brother-in-law in Sydney last year! We make another appointment for a few days later and Christelle’s father, who has wandered over, offers to come with his tractor. Now why didn’t he come by earlier??? It is nearly 9.30 pm by the time we get home. By now we’re pretty hungry, especially Jean Michel. 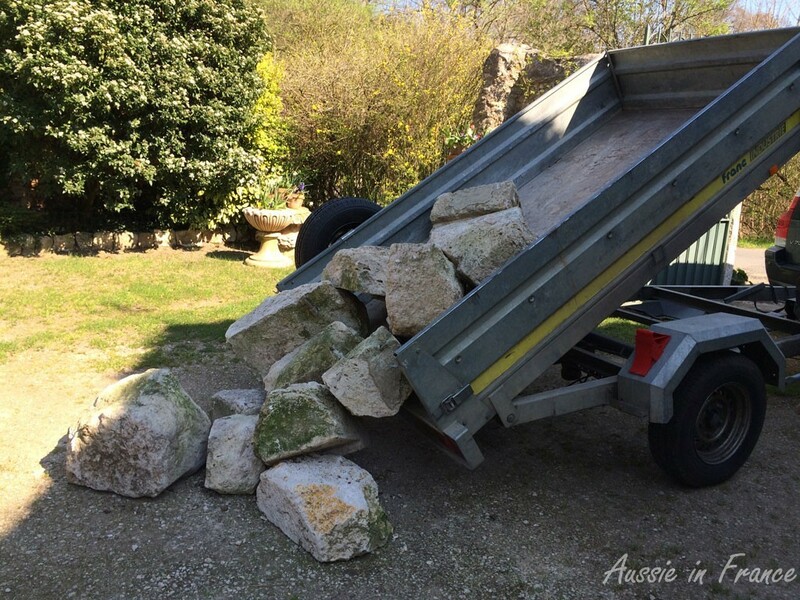 Next day, he up-ends the stones into the front yard – I had no idea our trailer was a tip truck – and uses the trolley to take them into the garden of our little house next door which is ready to receive them. 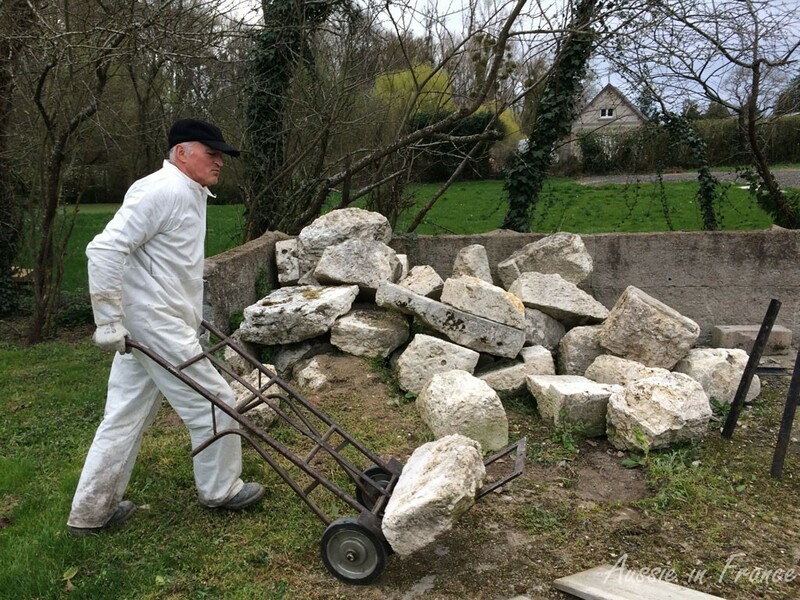 Jean Michel organises the stones into different types. As soon as we arrive at Christelle and Oliver’s house to pick up the next cargo of stones, Christelle’s father promptly arrives with his tractor. This time it only takes a half an hour to get the next 16 stones into the trailer. As a present, I have brought some cuttings from our garden: a little yew tree, a laurel and some winter jasmin. Christelle and Olivier are delighted. 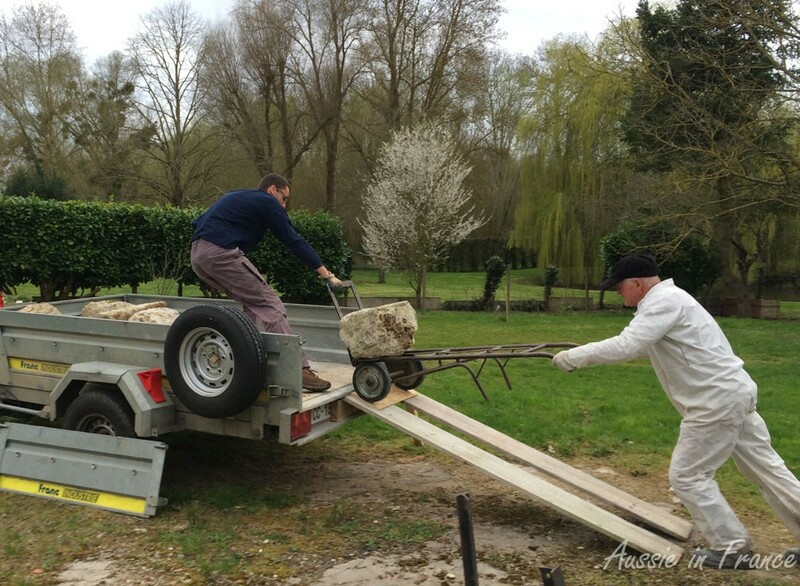 Loading the stones into the trailer is so much easier with a tractor! It’s the third and last trip. 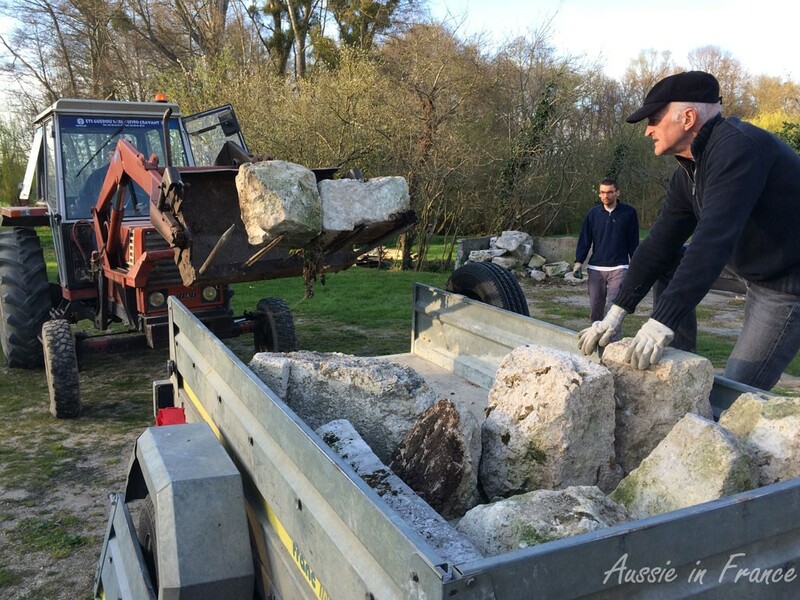 Christelle’s father, who takes every opportunity he can to use his tractor according to Olivier, has already picked up two stones on the fork lift by the time Jean Michel gets the trailer in place. 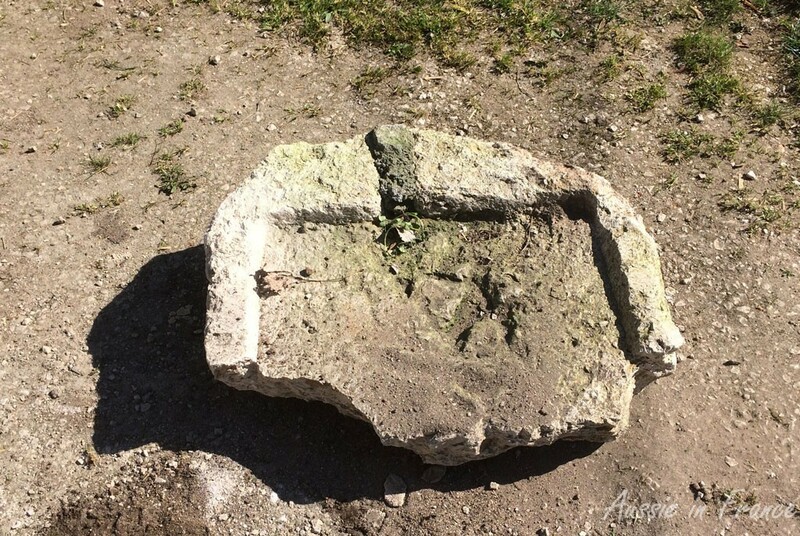 One of the stones is a sink. I hope we’ll be able to find some use for it. Theyve got it down to a fine art by now so, once again, within a half an hour, we’re all set and ready to go, with another 18 stones in the trail. However, I’m hoping that they’ll ask us if we want an apéritif again. It’s not an intermittent fast day! Christelle pops the question and we accept without hesitation. I would like to suggest that she invite her mother over too because I want to ask her more details about the way she keeps her geraniums in winter. Christelle telle me that she takes them out of the pots and hangs them upside down ! But I need more details. However, I think it might be a little out of place to do so. Olivier goes off and gets a bottle with EPINE written on it. We learn it is a homemade brew consisting of tender blackthorn shoots cut in the spring and steeped in brandy, red or rosé wine and sugar. I ask what the alcohol content is so I have an idea of what I’m drinking. Olivier does a rough calculation and comes up with about 20°. One glass will do me! 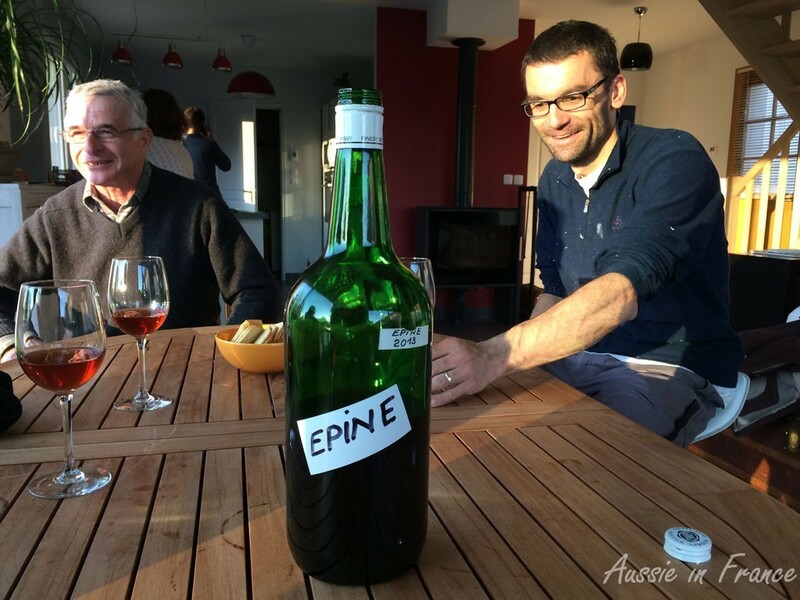 We sit round the table drinking the épine which is very tasty, and are joined by Pierre, who’s staying with them for a couple of days. 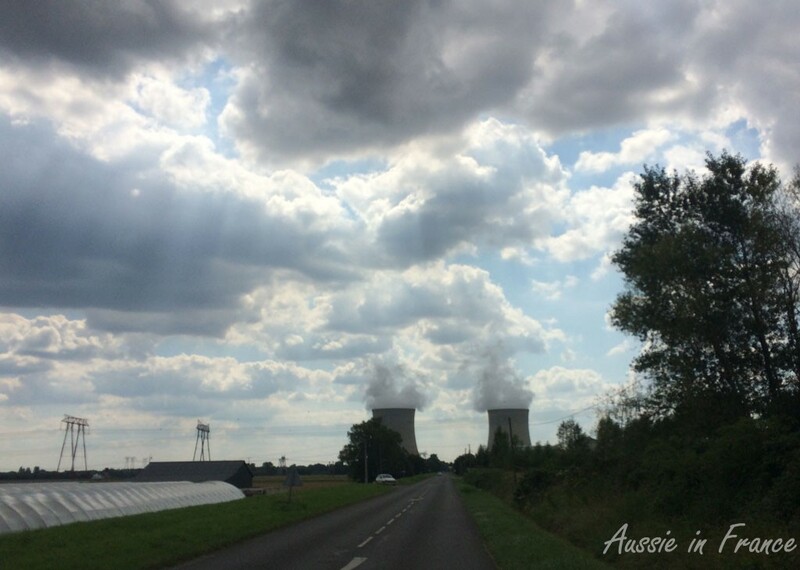 Because they live close to the Saint-Laurent-sur-Nouan nuclear power plant, there is occasional demand for extra accommodation which they offer on airbnb.com. What a good idea! The conversation mostly revolves around farming (and Australia) as Jean Michel is interested in knowing what Christelle’s father used to do. He grew cereal crops and raised beef cattle. Unfortunately he didn’t have a son to take over after he retired and he misses the activity. What a pity he lives too far away or we could ask him to bring his tractor over when Jean Michel is putting the stones in place! We leave reluctantly but it’s getting late. We have taken a liking to these two young people and their farmer father. We’ve only been gone ten minutes when Jean Michel’s mobile rings. It’s Christelle to tell us I’ve forgotten my jacket. So back we go. She comes out to give it to me. I’ll make sure I send her a photo when the window is finished so they can see their stones in their new home. We drive home into the sunset. 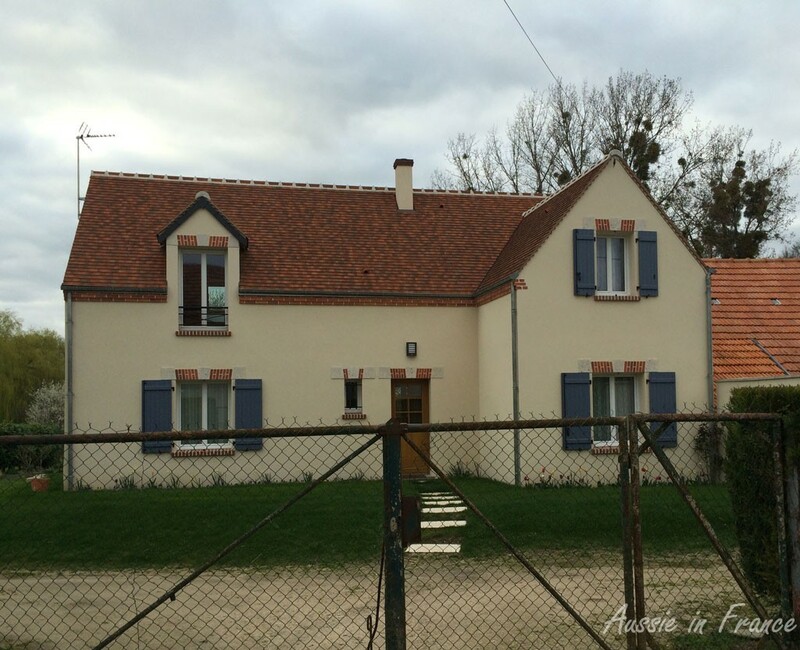 This entry was posted in Closerie Falaiseau, Flowers & gardens, Loire Valley, Renovation and tagged buying freestone in the loire valley, renovating an old house in France. Bookmark the permalink. Lovely article. My respect for JM’s skill grows even higher with this very serious large scale building project, stones no less. I am in awe of his abilities. Hi Jeff, I passed on your comments! Jean Michel says “merci”. 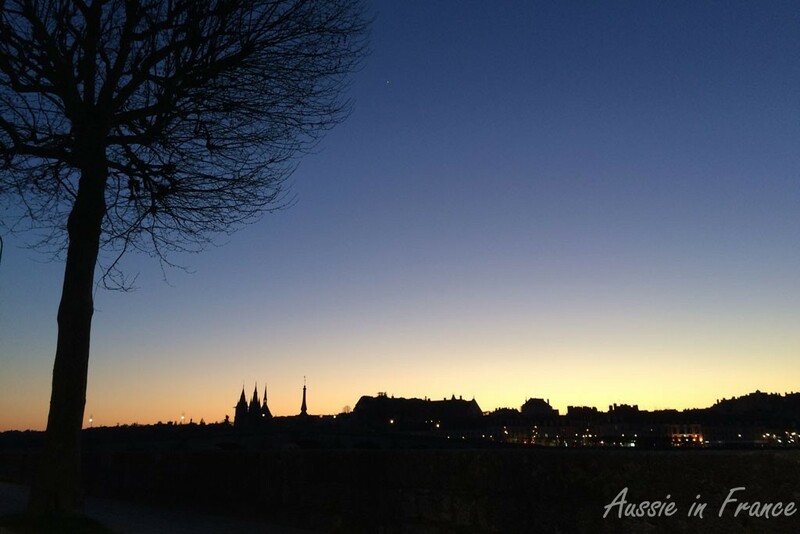 What a wonderful post to read, starting with the wisteria and ending with such a tranquil sunset. So much accomplished. And we really enjoyed it despite the total of 6 hours driving! What a lovely story. Hooray for farmer dad and his tractor! Epine goes well with melon I seem to remember. Lots of people around here make it. Yes, that tractor was really welcome and the family were so nice. Now I’ll have to learn what ashlar means. That is a whole lot of work. The look of the wisteria certainly is pleasing! We love that wisteria and can’t thank the previous owners enough for having the foresight to plant it 23 years ago!